To say that Shakespeare would have been familiar with the conspirators is an understatement. These traitors of the realm had some deep connections to Shakespeare and his family. 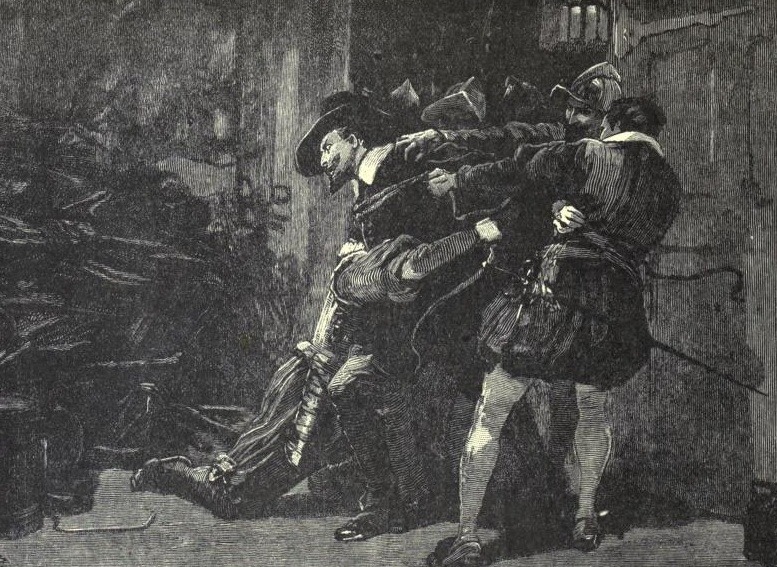 Shakespeare’s father, John (undoubtedly a covert Catholic) was friends with William Catesby, the father of the head conspirator, Robert Catesby. John Shakespeare and William Catesby shared illegal Catholic writings that eventually wound up in the attic of John’s home in Stratford. Moreover, the Mermaid Tavern in London, frequented by Shakespeare and owned by his closest friend and confident, was a preferred meeting spot of the turncoats as they schemed to obliterate the Protestants once and for all. Needless to say, Shakespeare, like his creation Macbeth, was probably tormented by “saucy doubts and fears”, waiting to see if he would be the next poor soul taken to the Tower. Theory has it that it is no coincidence Shakespeare decided then to write his only play focused on Scotland. The Bard was about to use all his skills as a great playwright to set the record straight with his sovereign, James I, the son of Mary, Queen of Scots.While the conspirators suffered the ultimate punishment of being disemboweled and beheaded in front of the cheering masses, Shakespeare would likely have been only a few miles away, holed up in his estate in Stratford, piecing together tales about different Scottish kings from old history books. Change after change was made until the play became a perfect propaganda machine that seemed to clear Shakespeare of any suspicion. James’ favorite part of Shakespeare’s new take on history would be the near mythological qualities given to the character created in his image – Macbeth’s victim, King Duncan. While the real Duncan was a war-loving Neanderthal, Shakespeare’s Duncan is a thoughtful, infallible, divinely-appointed ruler with “silver skin” and “golden blood.” Killing old Duncan is a calamity of such epic proportion that it sends the animal kingdom into a tail spin, with mice devouring falcons and horses chowing down on each other. Faith, here’s an equivocator, that could swear in both the scales against either scale; who committed treason enough for God’s sake, yet could not equivocate to heaven. O, come in, equivocator. (3.2.9-12). References Brooke, Tucker. Shakespeare of Stratford. New Haven: Yale UP, 1926. Burgess, Anthony. Shakespeare. London: Jonathan Cape, 1970. Child, Harold. English Drama to 1642. The Cambridge History of English and American Literature. An Encyclopedia in Eighteen Volumes. 2000. http://bartleby.com. (04/04/00). Levi, Peter. The Life and Times of William Shakespeare. London: Macmillan, 1988. Paul, Neill Henry. The Royal Play of Macbeth. New York: Octagon Books, 1971. Rowse, A.L. Shakespeare the Man. London: Macmillan, 1973. Speaight, Robert. Shakespeare: The Man and his Achievement. New York: Stein and Day, 1977.